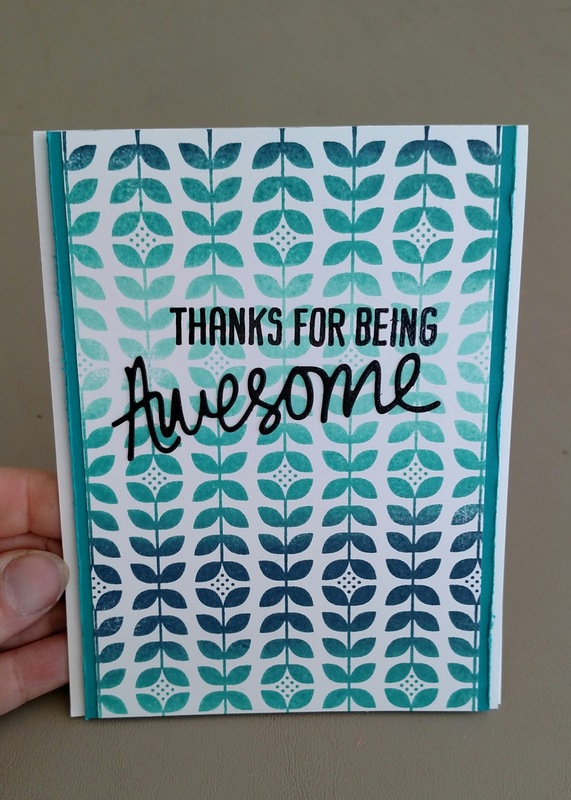 In the chaos that was the end of the school year, I knew I needed to come up with a few thank you's for school. My daughter is a type 1 diabetic and has spent a lot of time with the nurses. Having nurses at the school certainly gave me piece of mind. They were awesome and adored Tori. Even if she is a 14 year old! These are the cards I made to go with their gifts. The colors where chosen to match the Tervis cups we gave them. Super simple! 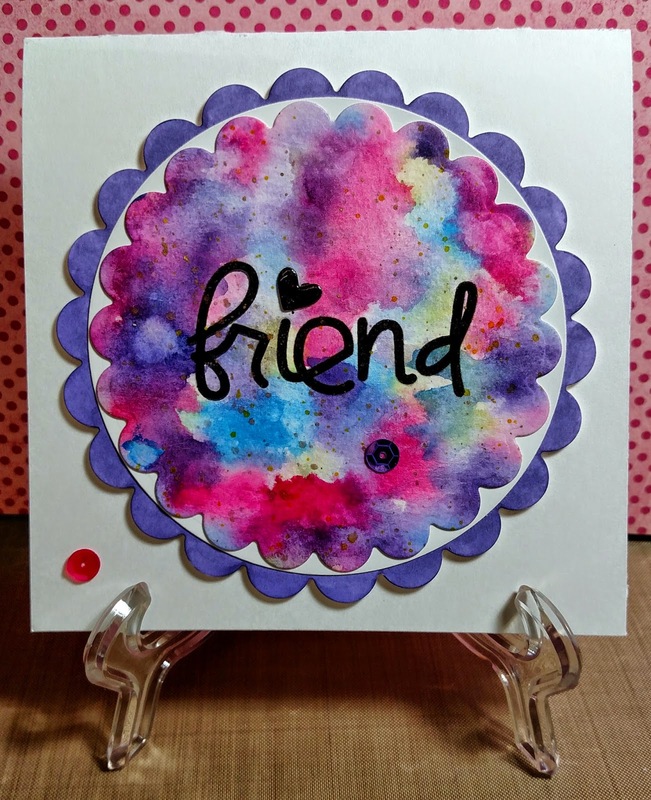 I used my new Hero Arts Ombre ink pads. I believe both background stamps I used are from Hero Arts as well. Thanks for stopping by! It's that time of year! The time where I struggle to come up with masculine cards for Father's Day. I find it difficult when the dad in question doesn't like sports, hunting, or cars! In fact, my father-in-law likes computes (not video games!). So I went hunting through my stash and came across Teen Routine by Paper Smooches. I think it ended up being just what I needed. The card design is a CASE from a card I came across but don't remember where! 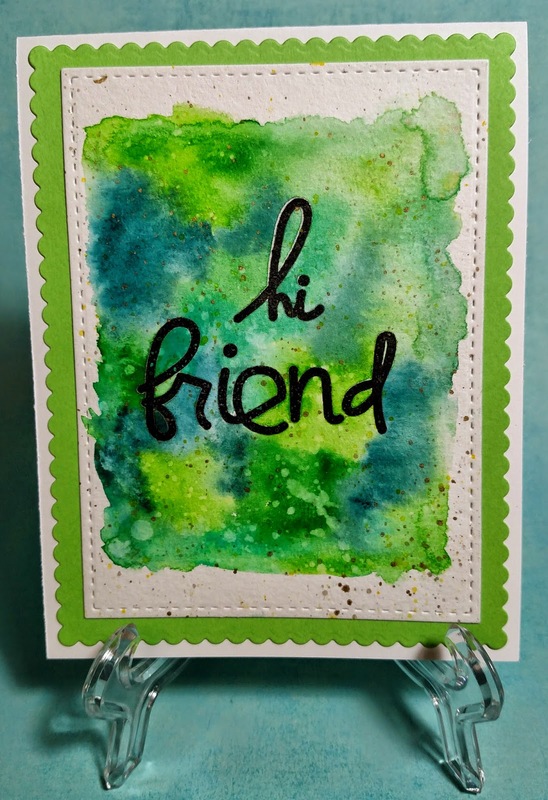 Inks used are Night of Navy and Sahara Sand from Stampin' Up. 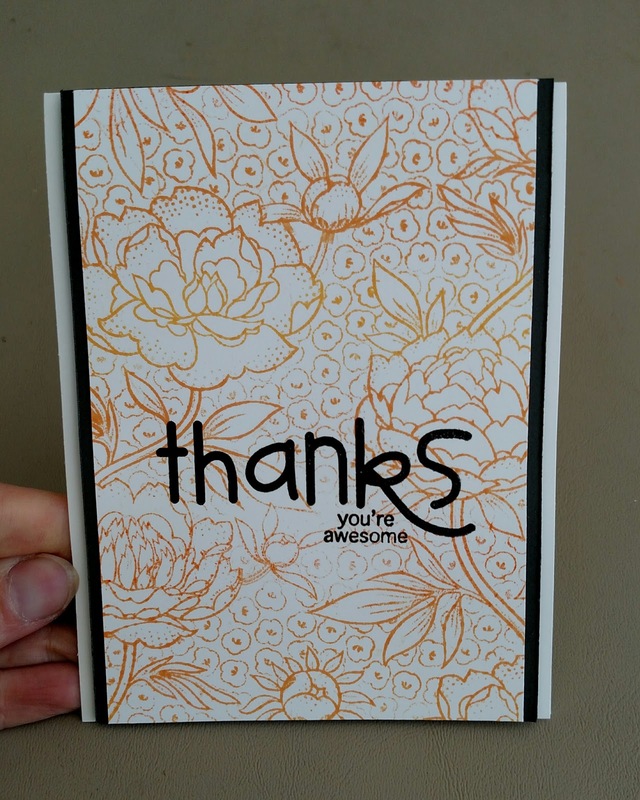 Patterned paper is from Basic Grey. 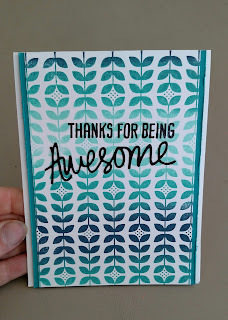 I used die cut letters from Lawn Fawn which I then colored with Wink of Stella and topped with glossy accents. I also used Wink of Stella on the navy strip. I didn't take a picture but on the inside I cut out a mouse and computer, then mounted on foam tape. I drew in the cord from the mouse to the computer. I promise this will be the last one for today! This is for the regular monthly challenge at Gerda Steiner Designs. Did I mention how much I love her adorable images? They are just so much fun to color. I tried a few new techniques with the copic coloring. After doing the normal blending, I tried using the dot technique to add a little texture. I think I need a bit more work but it was fun to try it out. Added a few details with a white gel pen and Wink of Stella. 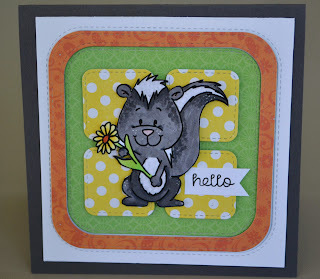 All of the dies used are from MFT Stamps. I don't know if you can tell in the picture but the orange frame is popped up and the green layer is flat. They yellow layers are also on foam. On top of that all is the sweet little skunk who also has foam tape. The hello is from Lawn Fawn and I hand cut the banner. Thanks for looking! It's been a fun crafting weekend! 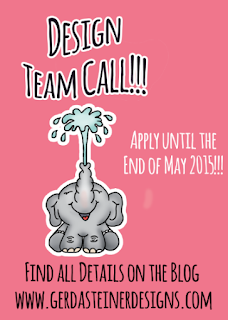 I am also entering this for Gerda's Design Team call! When I sat down the other day to make the bright green card, I knew I wanted to make two different cards. 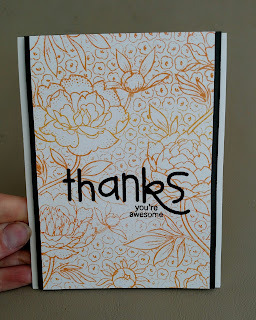 This one is for my best friend and I've been trying to send her a card every other week. I have to work on my picture skills because I don't think I caught just how vibrant the colors are! Similar to the green card, I made a shape on the watercolor paper first with clean water. This time I went with a circle. Grabbed the colors from my Kuretake Gansai set and dabbed it randomly on the paper. I splattered it again with the bright yellow and gold paints. I love how it gives it a little something extra. My circle ended up being too big for me to do any layers like I wanted so I had to cut it down. 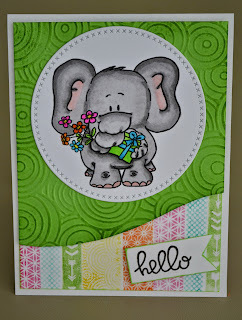 I used scalloped circle dies from Spellbinders. Mounted it on a white plain circle and then the purple scalloped circle. I didn't actually have the right color paper to match so I reached for my copics and just colored around the edges. I used BV08. The sentiment is from Bold Buzzwords by Paper Smooches. The little heart I colored black, used my clear Wink of Stella pen to give it some glitter and covered with Glossy Accents. The card turned out to be a 5"x 5" square. After I put it all together I found I somehow got a little black spot on the white base. So I whipped out a couple sequins and called it good! I've been trying to hard to participate more in challenges. It helps me get some much needed crafty time in my day. 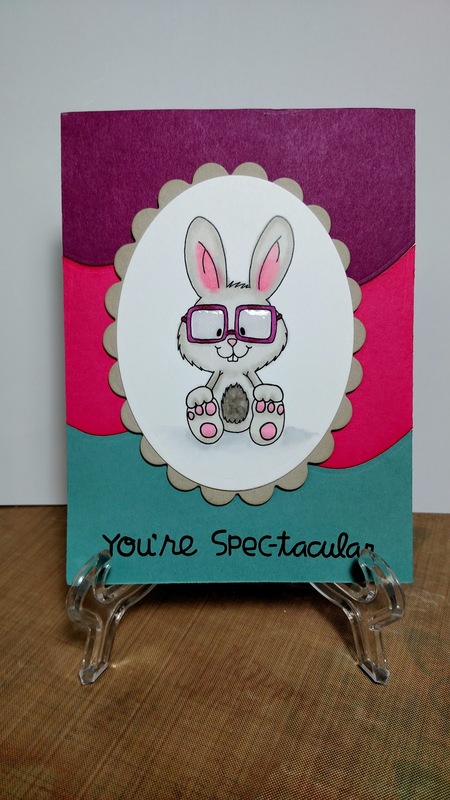 On that strain, I found another digital stamp challenge at From the Heart Stamps. 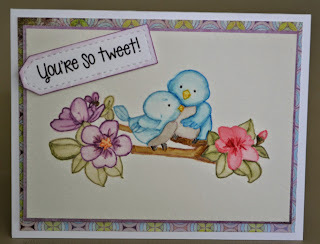 Check it out here: http://fromtheheartstamps.com. Again I chose to use Prismacolor pencils and Gamsol. Scallop strip is a Martha Stewart punch. 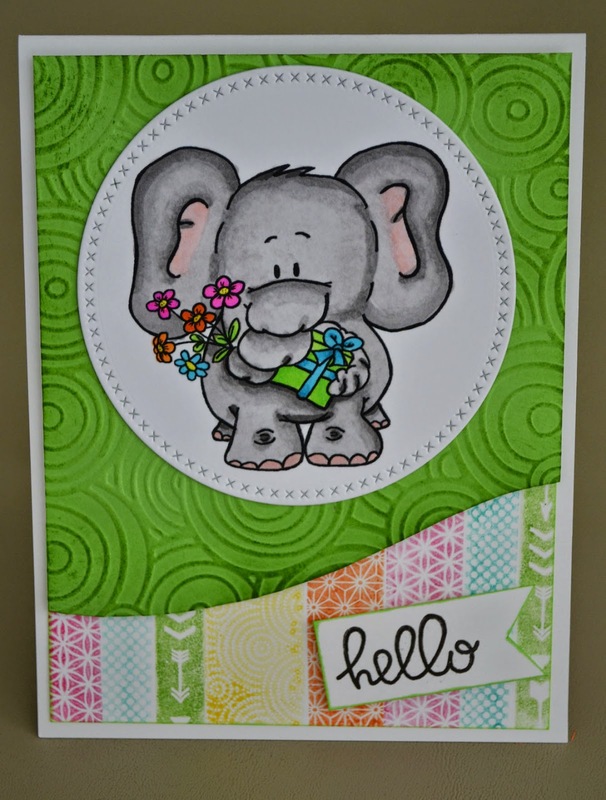 Banner die is from Mama Elephant. 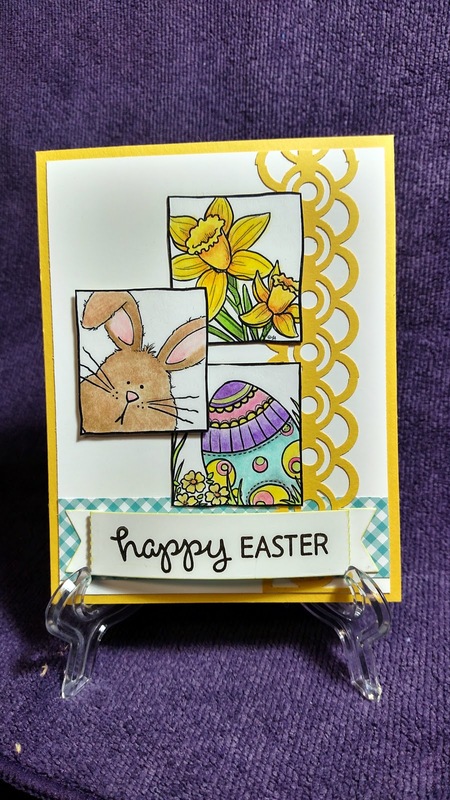 Sentiment is from Lawn Fawn's Eggstra Special Easter set. 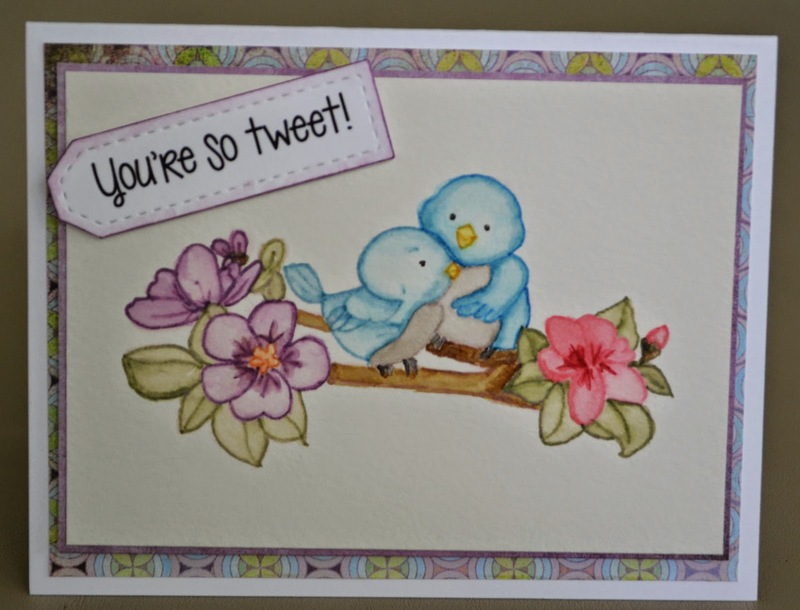 Sentiment was stamped with Versafine and embossed with clear embossing powder. Thanks for stopping by! I'm just getting started with blogging so I apologize for my generic looking blog. Hopefully I'll be able to devote some more time here! Happy crafting. 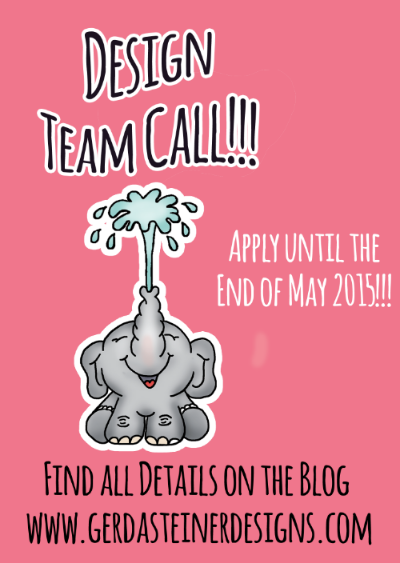 Another month and another Gerda Steiner challenge. The kitty and the chicks are just so darn adorable. This month I tried coloring it two different ways. This first picture was done using Prismacolor pencils and Gamsol. I really like the smooth look that I got. I also tried shadowing the image with a very light color and I am pleased with how it turned out. 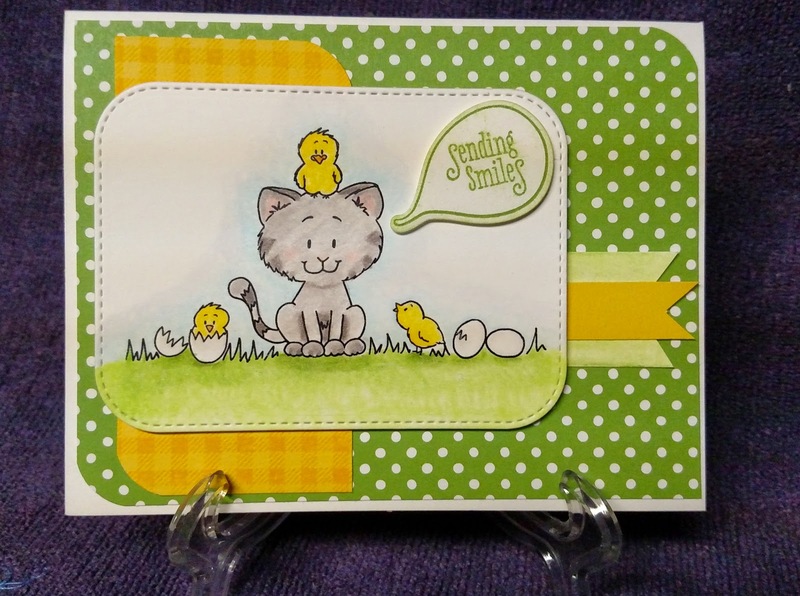 Polka dot paper is from Lawn Fawn and the yellow is from Stampin' Up. I believe it is Daffoldil Delight. The little bubble die and sentiment are from Wplus9's Bubble Talk set. MFT Stitched round rectangle die was used for the main white piece. On my second go round I used Copics. I like this one as well but felt the kitty turned out a little dark. 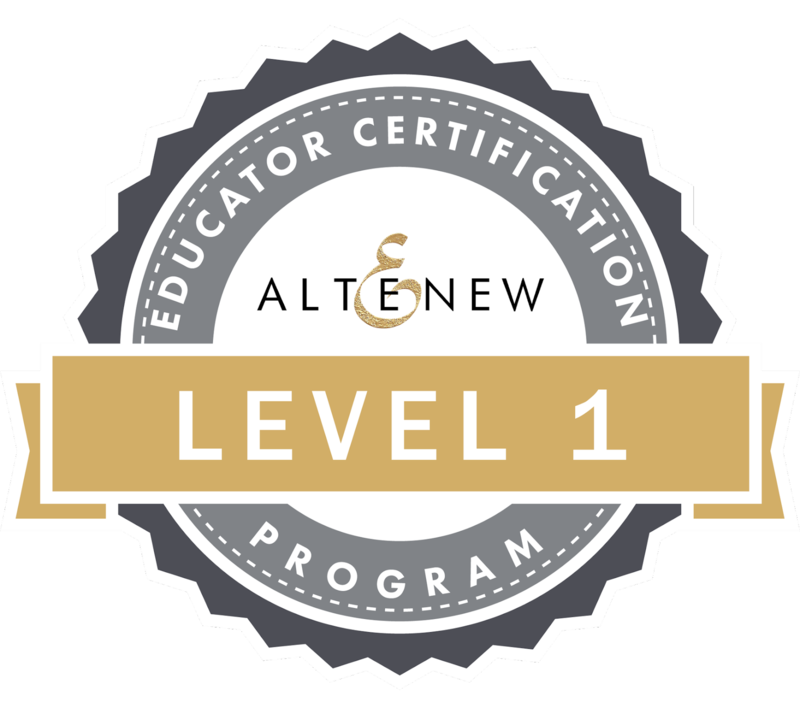 I used Y00, Y11, Y13, Y15, G02, G05, G09, R20, BG0000, W00, W1, T1, T3, T5 and T7. I also shadowed this image using the BG0000. For the background paper I used a Simon Says Stamp stencil, Mowed Lawn distress ink and Mustard Seed distress ink. I then sponged Mowed Lawn along the edges. I didn't have a yellow paper to match so I just used Mustard Seed on white paper until I got the colors I wanted. 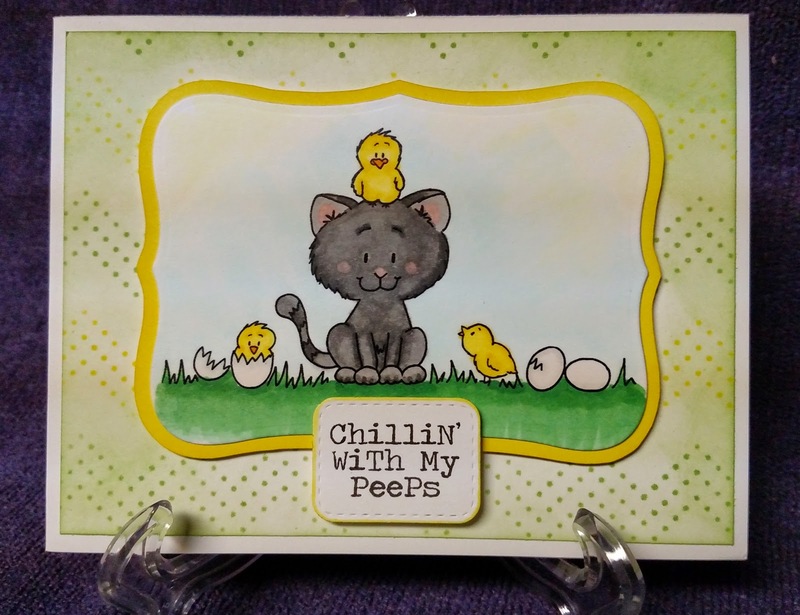 Sentiment is from Darcie's Chillin' Peeps set. I again used the MFT Stitched round rectangle die but the smallest one this time. Image piece was die cut with one of the Spellbinders labels. I just can't remember which one. I certainly enjoyed playing this month!